A symbol of the presidency, the United States government and the American people, construction of the White House began in October 1792. Two years previously, President Washington, together with city planner Pierre L’Enfant, chose the site for the new presidential residence – the official address of which is now 1,600 Pennsylvania Avenue. As preparations began for the new federal city, an architectural competition was held to find a design for the ‘President’s House’. Nine proposals were submitted and Irish-born architect James Hoban won a gold medal for his practical and elegant design. Aside from the colonnades which link it to the East and West Wings, the White House has changed little in its appearance since its completion. Although President Washington oversaw the construction of the house, he never lived in it. It was not until 1800, when the White House was nearly finished, that its first residents – President Adams and his wife – moved in. It survived a fire at the hands of the British in 1814 (during the War of 1812) and another fire in the West Wing in 1929, while President Hoover was in office. Throughout much of Harry Truman’s presidency, the interior of the house was completely gutted and renovated, although the exterior stone walls, first put in place when the White House was constructed two centuries ago, were left in place. Since its completion in 1800, each president has made his own changes and additions to the house. Presidents can express their individual style in how they decorate some rooms and in how they receive the public during their stay. Although the White House was built between 1792 and 1800, the whole interior was gutted between 1948-1951 due to imminent structural failure. When reconstructed, a steel frame was inserted in place of the wooden one and most of the rooms were rebuilt in their former positions. However, some major features such as the Grand Staircase were relocated and essential innovations like air conditioning were installed. The Executive Residence stands between the East and West Wings, linked by the East and West colonnades. It houses the president’s private rooms (ie his home), as well as state rooms for ceremonies and official entertaining. The four main floors consist of the ground floor, which includes the Diplomatic Reception Room, Vermeil Room, the main kitchen and other offices; the State Floor, which contains the Green Room, Blue Room, Red Room, State Dining Room and Grand Staircase; the second floor is the family residence including bedrooms etc; while the third floor contains a solarium and a games room. 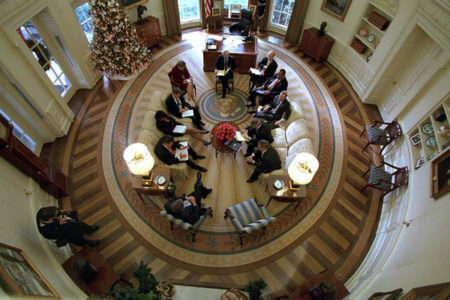 The West Wing houses the president’s office (the Oval Office) and those of his senior staff. With room for about 50 employees, the wing also includes the Cabinet Room and the White House Situation Room. Built in 1901 due to overcrowding in the main house, the West Wing was damaged by fire in 1929, shortly after which a second storey was added. President William Howard Taft (1909-1913) engaged Nathan C Wyeth to extend the West Wing, which included the addition of the Oval Office. President Franklin Roosevelt (1933-1945) had the Oval Office moved to its present location, by the Rose Garden, during his tenure. The East Wing, which contains additional office space, was added in 1942. Among its uses, the East Wing has intermittently housed the offices and staff of the president’s wife (the first lady) and the White House Social Office. In 1977, Rosalynn Carter was the first to place her personal office in the East Wing and to formally call it the Office of the First Lady. Although extra office space at the White House had been needed for some time, the East Wing was built during WWII to hide the construction of an emergency underground bunker. This bunker has come to be known as the Presidential Emergency Operations Center (PEOC); it is said to have been designed to withstand 50 nuclear blasts. Plus, make sure you also check out our digital-only specials, such as Amazing Inventions, Book of Extreme Survival and How Drones Work, available to download onto your digital device now! How was Mount Rushmore sculpted? Previous story Special 4th July weekend offer for our US readers!